A metal lathe isn’t the first tool you think about when it comes to welding, but for some tasks it can definitely come in handy. When you don’t just need to join metal but also shape the pieces, having a lathe in the shop or garage can make life easier. Let’s take a little look at how they work and get an overview of a couple models you might be interested in. Here, we’re not going to look at welding lathes, which are a creature unto themselves. By Gregory Sanders: This article has been updated to reflect the most accurate information regarding metal lathes available for those who are interested in welding equipment. The best 5 available have changed, and information has been added to assist individuals in finding the best metal lathes currently available on the market. The FAQ has also been updated. 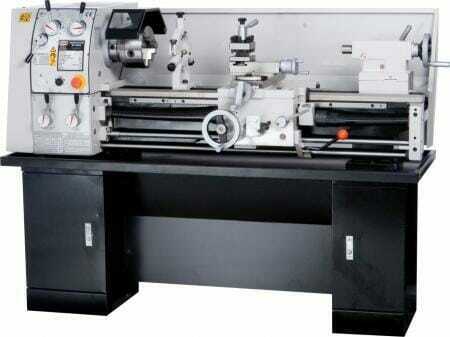 Let’s have a look at some good metal lathes. We’re only going to look at bench models here because we imagine they will be of the most interest to our readers starting out. Grizzly is a fitting name for this brand because they really make a mean machine! But it’s a great value for a starter lathe. At 10x22 inches, it’s a solid machine with a good weight and size. It’s simple to setup and use and works out of the box. It runs on 110 volts and runs at 6 speeds from 150 to 2400 rpm. It includes 33 inch threads and 26 metric threads. In case you need any replacement parts at some point, they are easily available through the company. On the negative side, the machine has a tendency to squeak at times and the paint is a bit flaky. Prolonged use can make the motor heat up a bit, but placing a table fan near the heated motor allows you to work longer with the machine. The Shop Fox M1099 is a larger lathe. Changing the thread selections is rather quick and easy. You just need to refer to the thread chart and rotate the alphanumeric dials on the gearbox to make a thread change. It’s a six-speed lathe with a one-inch spindle bore, a selection of chucks, faceplate and other accessories. It runs on a regular 110v line. This machine provides accurate cuts and finishes since it has a full-featured carriage and apron assemblies. It includes two chucks and a steady rest, a skilled welder might be tempted to give this machine a try! The machine has a three-jaw chuck to help make centering your workpiece easier. A four-jaw chuck is also included, although it requirements more manual adjustment. Unfortunately there is no power cross feed on this machine. Another drawback is that it is not reversible, so left-handed threading is not possible. The Jet 321360A is a bit more versatile. It has 12 spindle speeds ranging from 60 – 1240 RPM. It has a larger spindle hole than many other machines in its class, at 1 ⅜ inches. The slower speeds available might help it be more useful for welding on the lathe. It has 40 inch threads and 27 metric threads. The 2 HP motor is powered by 230-volt input. Its measurements are a 13” swing by 40” centers. There is a stand available specifically for the machine as well. This lathe machine comes with a two-year warranty and a helpful manual and customer support if you have the need to consult them. The Grizzly G8688 might seem like a miniature version of a metal lathe. It’s just a 7” by 12” machine. But it’s still got a bit of power. The motor is just ¾ HP and it can in low mode up to 1100 RPM or high mode to 2500 RPM. Surprisingly for a small machine, it’s fully reversible at all speeds. As you would expect with such a small motor, this machine runs on 110 volts. If you have limited space and only plan on small projects, this makes a great machine. Just remember - we said small projects. And we mean it. This is not a heavy-duty machine by any stretch of the imagination. Don’t go into it with high expectations. But if you just want something extremely basic, it may work for you. The Precision Mini Lathe by Central Machinery is another small machine for those who don’t want to dedicate a lot of space to a lathe. Again, it’s a hobbyist machine, not a production tool. But keeping in mind its limitations it may work for your needs. It runs on 110 volts at 1100 or 2500 RPM. The threads measure 12 to 52 TPI. The machine probably actually measure a bit under 10”, however. It’s also important to give the machine a thorough once-over before starting it up. There have been reports that bearings and bolts weren’t appropriately tightened - which could be a factory issue or something that worked loose during shipping. Documentation is lacking and customer service doesn’t have a good reputation, either. It’s not a top-of-the-line machine, but if you’re just planning some occasional light work, it’d fit well in your garage. A lathe is a tool used for shaping a piece of material. Probably more common are wood lathes. But there are also special lathes designed for metals. The metal is rotated under a blade rapidly to cut it into a consistent form. There are various types of lathe, so let’s look at a couple of them. Most of them are definitely not machines for the hobbyist or small welding shop. But it’s always good to have some background. Lathes can be broadly divided into three main categories: the engine lathe, the turret lathe and the special-purpose lathe. 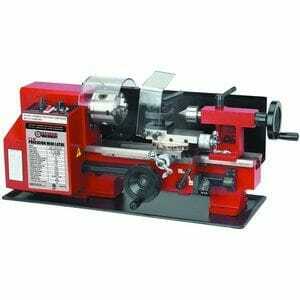 Some smaller lathes can be mounted on a bench and are also semi-portable. Larger lathes have to be mounted on the floor and may even need separate transportation if they are to be moved. For the hobbyist or small shop, it’s usually the engine lathe that makes a good match. Some say that the engine lathe can alone accomplish more jobs than many other such tools put together. Turret lathes and special purpose lathes excel in jobs that require mass production. A metal lathe on the other hand refers to a huge category whose specific role it is to work on tough materials. Nowadays even plastic and a whole range of other materials can be handled by these machines. The engine lathe is sometimes referred to as a center lathe. It can also be called a bench lathe when it’s compact enough to be mounted on a bench. There are smaller “micro” and “mini” lathes as well. A crucial element in choosing a metal lathe is size. This affects the pieces it can handle, of course, but also whether you have space for it. This is not the kind of tool you can just tuck away in the corner, so be sure to consider your available space and the size of the machine when making your purchase. On the other hand, it’s good to get the biggest one you can - you’ll always think up some project to do that’s just a little bigger than what you originally had planned! You’ll also want to consider whether it’s a 110v or 220v machine. Obviously, a 220 will provide more power. But if you’re not wired for that and don’t plan to be, it’s not going to provide any power at all. How Can A Welder Use A Lathe? Just a reminder, there is another lathe type called a “weld lathe” or “welding lathe” which is specifically designed for doing welding while your project is spun by the lathe. But here, we’re looking at metal lathes. Having said that, you can use a metal lathe to turn your workpiece while welding. This is particularly useful for piping or other similar round pieces where you want an even weld all the way around. However, you need to be sure to properly ground your welder - do not ground it to the lathe, as you can blow it out. You also need to be sure that your lathe will rotate slowly enough to allow your welder to actually create the weld pool. Metal lathes are better used when you want to shape your material. This isn’t directly related to welding, but can still be helpful for metalwork. If you need to trim material in a uniform manner all the way around your workpiece, the lathe is probably the tool for the job. If your passion or job is to manipulate metal, a metal lathe might make a nice complement to your welding tools. There’s a whole range of options available, from huge machines to simple benchtop ones. With the smaller ones, you have to be careful what you’re getting yourself into, but with some caution and research and you choose a decent machine for the level of work you plan to do.